Even though I started Girasole before this, I wanted to participate in a Veera KAL in the Sweater Odyssey group on Ravelry. I have wanted to make this ever since I saw it on Veera’s projects, but I did not know it would be so big and use so much yarn. I ran out of yarn so the sleeves are shorter and tighter, but more notably, the right panel is over 4″ shorter than the front. It works out in that two of the front panels would be hot. I just throw the left over the right and can pin it with a shawl or kilt pin. I am not crazy about this cardigan. It disappointed me especially when I liked it so much, but I must say the colour of the cardigan is lovely! It is baby alpaca that I got on sale for this project too. Paris, started May 25th 2012, Bound off June 25th 2012. Yarn: Inca Gold Baby Alpaca by Susan Andrew Collection – 6 balls – 1200yards/1100m. 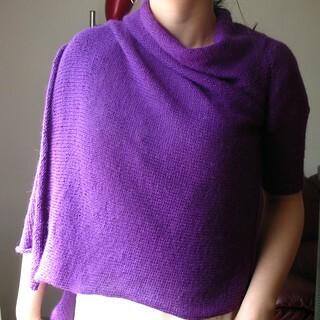 Modifications: I did the sleeves before finishing the right front. I decreased two stitches the sleeves every five rows to make them around 50 sts (I can’t remember). Sleeves were knit to 9″ in total. Did not sew pockets. Cost of Project: Yarn was on sale, cost around $34. That is exactly what I am into wearing at the moment, I love them in long sleeve, short sleeve, medium sleeve, and the fact that you can wrap one side around when it gets a little chilly is perfect. Hi Wool Diaries! It is very warm and good for cool summer evenings especially. Thanks for the comment! You are right, the colour is beautiful. I can’t see that the sleeves are not as suggested in the pattern. I like the cardigan escpecially because it is asymmetrical.